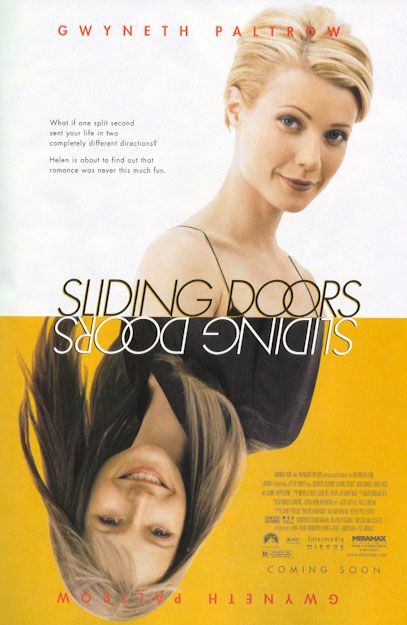 I never saw the movie Sliding Doors. If I had, maybe I wouldn’t be writing this post. For those that have never heard of it, the plot of the movie centers around the two possible lives a woman may have had depending on whether she made it on to a subway car or not on one fateful night. How many sliding doors do we make or miss every day in our lives? According to some physicists, every decision we make is Sliding Doors in the making. Every decision we make creates two or more possible outcomes, with every possible outcome actually occurring in separate universes. Some of those sliding doors lead to minor, almost undetectable changes in our lives; others can have dramatic effects. It’s enough to paralyze one’s decision-making ability, which I’m sure is one of the sliding doors. It makes you wonder what your life would be like now had you taken a slightly different path early in your life – a poetry course instead of American Lit in school; or a skiing trip instead of the beach or home for Spring Break; the drug store instead of the grocery store to pick up some Advil. Would you still be you? What does this have to do with running? Nothing really, except this – many of us go through life not really thinking about the sliding doors we may or may not be going through. We don’t think about what doors may be closing for good on us as we walk past them. I am making an effort to make sure that I do everything I can to maintain my health and my ability to run. I am actively looking for the sliding doors that I think will make me a better, stronger and more enduring runner and in the long run, a healthier old man. It’s still a guessing game. You never know for sure which sliding doors lead where, but you can make educated, pro-active guesses, and do what you know is right for you. Sitting on the couch with a pint of ice cream after dinner or going for a walk? On any given day, either choice will probably not have long, rippling effects, but making the same bad choices on a daily basis certainly will. What doors did you walk by today? Matt – I have not seen the film either – but I think you really touched on something insightful and wonderful today. Joe – Thank you so much. Means a lot to me that you’ve stopped by! This reminds me of the commercial for the cell phone company where her phone is a little faster and all these wonderful things happen to her instead of what would have happend if she had a different service and not as fast. I tend to live my life in the now. Can’t be concerned with what could have been had I taken a different route. Gives you something to think about though. Absolutely! And I don’t think the two (smart choices and enjoying the now) are mutually exclusive. on September 16, 2010 at 11:11 am | Reply Sam F.
I think about this all the time. I’ve made a lot of decisions in my life to lead me down the path I’m on. There are all sorts of things in my world that could be better, but I’m extremely grateful for the position I’m in. Everything falls into place the way it’s supposed to and it’s just amazing. I have a lot of faith that I’m exactly where I’m supposed to be and because of that, I wouldn’t change it for anything. Following what you have done this year Sam, I know that you are exactly where you are supposed to be, not only for yourself, but the rest of us for whom you so determinedly run for! I can trace the existance of everything I care about in life today to a single act of kindness I gave to a complete stranger in a parking lot in Salem, MA in 1994.
this post is a great reminder that our daily choices can make a big impact on our lives. each new day is another chance to become better and grow! exactly! you just took my post and boiled it down to 2 sentences! Haha every time I make a decision in this life, small or big, I think about this movie! I think about whether I should step in or wait and let the doors slide without stepping in. The choices we make have such a big impact on everything around us. And in regards to the multiple universe theory, which I do believe in, I think the best we can do is to make the best choice we can make given the current information we have on hand. Always think about how your world would turn into if you make any of the other choices, and then make your decision accordingly. I started my day reading a great blog about a woman who always seem to know the right thing to say, she’s the gal we all aspire to be….and I end my day reading a blog that asks the question, did I slide through the right doors and make the right decisions? Hmmmm, both great blogs with real thought provoking questions. I know one thing, I am fortunate to know these blogs and the writers a bit too. the good fortune is ours darlin’! I just ordered the book from Amazon, its in transit. Sliding doors might be easier to understand than quantum physics, but you never know. I think I’m going to have to check that out! Funny, I think about this phenomenon all the time (actually, I used to think about it a lot more when I was in college, doing illicit things for almost 10 years, LOL). I’ve realized because of this that there are really no good or bad decisions. Good and bad outcomes yes, but making a decision is taking action and taking action is what we are all here for. If you avoid decisions and therefore take no action, life simply passes you by. And that is bad. It’s this type of thinking that allows us (me) to have no regrets. I don’t regret the decisions I’ve made and the subsequent actions I’ve taken because all of them have made me the person that I am today. And I’m pretty happy with who I am.